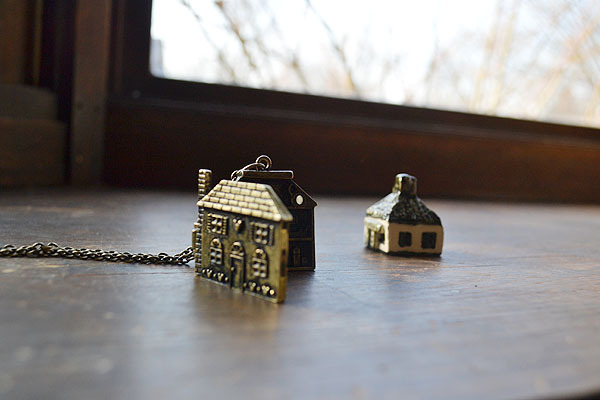 dressed up like a lady: Little houses. 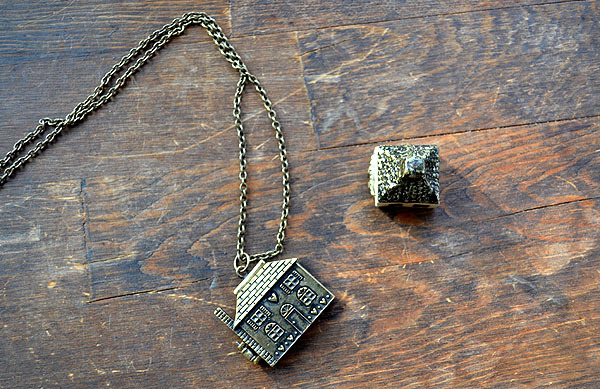 Readers keep asking if my the brass pendant I've been wearing was a "housewarming" gift from MC, so I thought I'd give everybody a closer look! 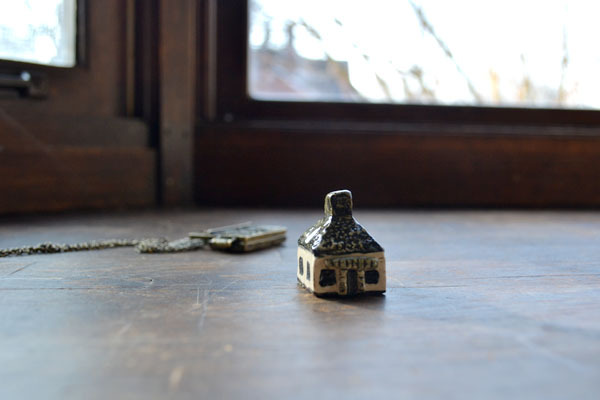 Here it is, along with my gift to MC -- a tiny little porcelain house. 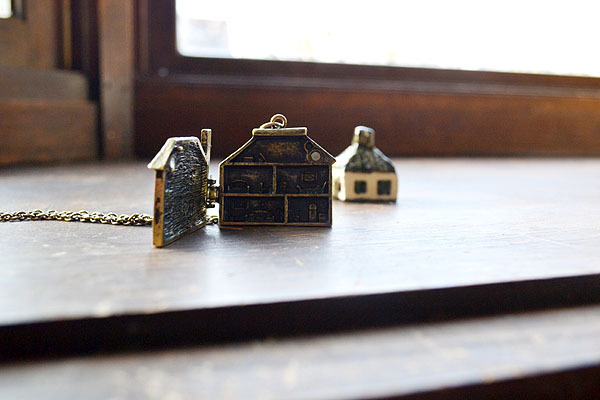 A particularly cute thing about the pendant is that it opens up to show a little cross-section of the inside! 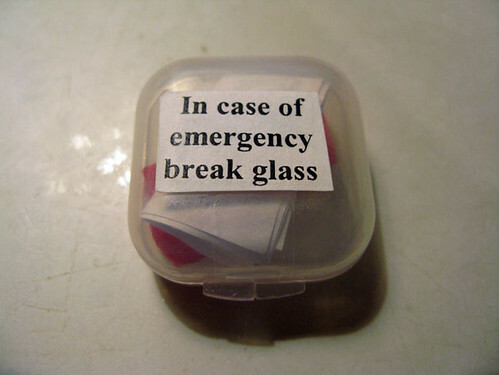 MC and I have a tradition of giving each other little gifts now and then -- something small and inexpensive, with a little love poem attached. I highly recommend the practice! It's cheap and easy and completely brightens the day for you both. He usually gets me a matchbox car Firebird Trans Am (my favorite), and I give him miniature versions of just about anything. 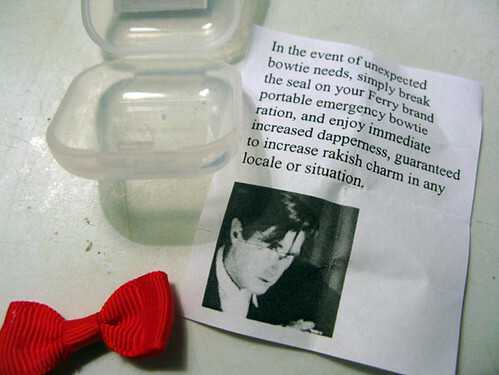 Just in case you're curious how this practice got started between us: the first Little Gift I gave MC was a tiny bowtie, which I left for him on his desk at work, the first week we were dating. I originally purchased it from a seller on Etsy (who intended it for a doll or a bear, I assume), with plans to give it to MC as a nod to both his tremendous style and deliciously perfect stature (which is to say, we are the exact same height). This is how I packaged it. I'm in love, which is why my blog has been so quiet lately. Mike, too, is the exact same height as I am. I forgot how amazing it is to be so mad about a person. And, I can not wait to see what you two do with that new dream home! So happy for you. I think I've just fallen in love with your relationship ;) You two keep amazing me every single time. You're both adorable. But lovely adorable, not Mr & Mrs Diabetes. My favourite silly lil nothin' my love gave me was a mini red Mercedes, because for days I was singing (badly, I might add) "Mercedes Benz". Funnily enough, we bought a new TV a few weeks later. It's fate I tell ya! Excellent.I can not wait to see what you two do with that new dream home! Ah! you two are too cute and my dear, you have quite a way with words.